John “Roman” Romaniello is a trainer in NYC, physique model, literature geek, great writer and all around good guy. Oh, and he can do a mean push up. But that’s not why we like him. As fitness pros, we’re drawn to John because of his rare combination of muscle and movement control. 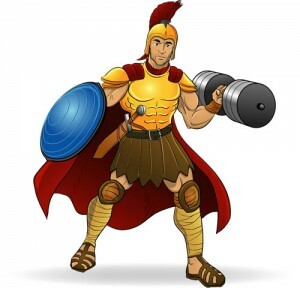 Roman is the perfect foil to the myth that you can’t be muscular and still have good mobility, flexibility and a high level of skilled movement. His mastery of perfect technique spans a wide range of exercise modalities, including bodyweight. The term Mechanical Advantage has been around for ages, but it’s usually applied to weight training. The principle involves combining 2 or more exercises that work similar movement patterns into one extended set. But the “trick” lies in the fact that each subsequent exercise puts you in a more “advantageous” mechanical position. Check out the video, where John uses the push up to demonstrate this approach. Doing the exercises in this order lets you hit the toughest movements while you’re fresh. You then progressively drop the resistance by changing the leverage through a simple realignment of your body position. It’s a clever way to squeeze out more reps. AND you get better and stronger at the more challenging movement variations WHILE still getting a full workout. That’s good thinking! Roman suggests starting with 10 reps of each move, for a total of 30 presses over the course of the extended set. But you can adapt the numbers to your current level of strength and conditioning. You can also use other variations of pressing exercises to mix things up. The important thing is to go from the position of least mechanical advantage (the toughest exercise) to the position of greatest mechanical advantage (the “easiest” version). Give this a try and let us know how you did in the comment section. And for bonus points, let’s see ya get a little creative. Give us your best example of a bodyweight mechanical drop set circuit using different exercises than the ones Roman shared. There’s no prize short of the recognition of your peers. And the knowledge that YOU are the craftiest reader in BodyweightCoach Land. I like pull-ups. I use an Iron Gym, one of those door jamb bars with multiple hand grips. I do the wide grip overhand pull up first, then the parallel hands, hammer grip pull up and last the under-hand narrow grip chin-up. The drop set goes from back muscle concentration to more arm muscle reliance. I find that to be a solid drop set that is easy to push through multiple times a week. I often employ the concept of mechanical advantage drop sets while doing dips. Performing each maneuver to fatigue and without pausing between progressions, I begin with ring dips, move to standard p-bar dips, and finish with feet-elevated chair dips. This sequence comprises one set, is repeated 3-4 times, and is often incorporated into a “giant set” of bodyweight exercises (eg. pullups–>dips as above–> leg or core maneuver). A similar but shorter progression I enjoy uses standard p-bar dips to fatigue proceeded immediately by one minute of isometric upper arm support on the dip bar (i.e. simply hold yourself up on the p-bars with every muscle in your body held tightly). Adam and Ryan, you guys rock. Thanks for being the best bodyweight training resource on the internet! Manuel, Jeff and Eric… Great ideas guys! Thanks. Thanks so much for posting this, glad your readers are liking it. Eric, that’s a GREAT strategy–p-bar dips are LEGIT. Dips are one of the best triceps exercises period, bodyweight or otherwise, and you have a great idea for employing them. Thanks! I’m going to try this in a superset with lunges. Should be a great metabolism jack. Thanks, as always. This is a great idea. I’d like to try this with pull exercises. Start with regular chins, then do assisted chins (I like to place my feet on something, don’t really need a machine for this) and then body rows. Or chins, body rows, assisted chins. This also reminded me to add pike push ups to my workout. I keep forgetting to do that. Great Progression. Love what you guys are doing. Keep up the great work! My current program is based entirely on bodyweight drop sets..
I’m confused about what should be my progression benchmark?? I have a detailed 20-25 steps progression for PUSH UPS,PULL UPS, SQUATS, ABS, PIKES…so how should I determine when to progress to the next more difficult variation?? Eagerly waiting for ideas. Drop sets are working great for me, so I want to stick to this by progressing with more difficult variations.. Right now its Decline push ups (most difficult) as the starting point & wall push ups (easiest) as the finishing point..Once I progress its gonna be Decline Spiderman Push Ups (most difficult) & Incline push ups (easiest) as the finishing point.. I intend to progressively add a difficult variation & simultaneously let go of the last easiest variation..The only question is how do I set a benchmark to determine when to progress…. Thanks a lot in advance..Sorry the post became a little lengthy..inconvenience is regretted..